John Chisholm was found guilty witnesses gave evidence anonymously for the first time in a North East courtroom.A jury was told how Robert Anderson suffered wounds to his chest, arm, leg and thumb after the BMW he was driving was ambushed in broad daylight by Chisholm in Hylton Road, Sunderland.Newcastle Crown Court heard that on May 24, 2007, Chisholm carried out the brutal assault in revenge for an earlier attempted shooting of his son, which Mr Anderson was accused of being involved in, but later cleared. Chisholm snr denied wounding with intent, violent disorder and intimidation.The 49-year-old claimed he had been the victim of a "campaign of violence" by Mr Anderson and Alan Smart, who was the passenger in the BMW, and had lashed out after he saw a gun in the car.But jurors yesterday found him guilty of wounding with intent and violent disorder. He was cleared of the intimidation charge. Speaking after the case, Sunderland's top police officer, Chief Superintendent Dave Pryer said: "Any criminal who considers themselves untouchable or above the law will certainly find no comfort in this city. "Judge Tony Lancaster adjourned sentence until February 23 so Chisholm can be sentenced along with his son John Chisholm jnr, 27, and Carl Waters, 45, who admitted violent disorder at an earlier hearing in relation to the incident. The judge ordered an assessment from the probation service of Chisholm snr's "dangerousness". The maximum sentence he faces is life.After the guilty verdicts, Detective Sergeant Paul Milner thanked the terrified witnesses, who saw the horror that day, for coming to court.The onlookers had been too afraid to come to court to give their evidence but were granted anonymity under new laws. Anthony Perry, 22, an alleged member of a Jamaica Plain-area gang was fatally shot in broad daylight at a busy shopping district in Jamaica Plain yesterday afternoon, shocking passersby who watched in horror as an MBTA Transit police officer tried to save the man's life on a crowded sidewalk.The man was taken to Brigham and Women's Hospital, where he later died. Police did not release the victim’s name last night, but two law enforcement officials with knowledge of the investigation said he is Anthony Perry, 22, an alleged member of a Jamaica Plain-area gang.Perry was shot in the head, one of the officials said. The officials asked for anonymity because the case is under investigation.The brazenness of the 1:40 p.m. shooting alarmed police, who fear that Perry's associates could retaliate and jeopardize a fragile truce between two rival street gangs with a long history of violence. "The victim is well known to us," said Elaine Driscoll, a spokeswoman for the Boston Police Department. "Investigators believe this was a targeted incident. "Perry's family did not want to comment last night.After the shooting, four people were seen speeding off in a Pontiac down Walden Street, and police credited a detective from the B-2 division in Roxbury with seeing the car and stopping it. The men were brought in for questioning, and late last night two of the occupants were charged in connection with the shooting.Chris Jamison, 23, a reputed rival gang member, was charged with murder, unlawful possession of a firearm, and unlawful possession of ammunition, Driscoll said. Shaba Olukoga, 19, was charged with being an accessory after the fact of murder, she said. The two are expected to be arraigned today.The shooting occurred at the intersection of Centre and Walden streets, near the Fellowship Church of God and not far from a Stop & Shop shopping plaza.The business district is typically crowded during the afternoon, with car and bus traffic and pedestrians from the Jackson Square train stop.Witnesses said Perry tried to flee after the shooting, making it more than 30 yards along a row of shops before collapsing in front of the 99 Cents shop, at 319 Centre St."He was just on the ground bleeding. People were around him screaming, 'call the police,' " said Johaira Suazo, of the Castillo Services cellphone store. She said a woman came rushing into her store, horrified, and that's when Suazo saw Perry collapse.Several residents took video footage of the scene. A police official - later identified as Detective Lieutenant Mark Gillespie of the MBTA Transit police - can be seen trying to resuscitate Perry. Gillespie struggled for several minutes until an ambulance crew arrived.The area, near the Bromley-Heath housing project, has had violence before - but not like this and not during broad daylight, residents said. The city, which has a long history of organised, violent crime, has seen a flare-up in recent months of brutal score-settling among gangs competing in the flourishing drug trade. Kalashnikov assault rifles have become a common weapon after being imported in large numbers from eastern Europe. The new gangs, which are loosely or barely organised, include Balkan criminals and youths from immigrant housing estates and gypsy travellers' camps. Two men were shot dead and two badly wounded in one shooting at a travellers' camp last July. Over a dozen died in drug trade killings last year. Gunmen armed with an assault rifle and other weapons killed three men and wounded two others in Marseilles today in the worst ambush in recent gang wars among drug dealers of gypsy origin. Attackers armed with a Kalashnikov and up to three heavy pistols ambushed the victims' Peugeot in a rough district in the north of the port city shortly after midnight. More than 40 bullets struck the car and the driver was hit 15 times by shots fired from very close range. One of the wounded was found lying on a nearby railway track with critical chest wounds, while the other was taken to hospital by a friend. The victims, who were apparently unarmed, were ambushed when the other vehicle drew alongside their car while it was stopped at a traffic light in a deserted area. Police assumed that the massacre was prompted by a drug transaction that went wrong. A 250 gram (8.8 ounce) cake of cannabis resin was found at the scene. The five were described as aged 26 to 31 and from semi-permanent camps of travellers which have spread up around the Marseilles area over the past decade. Police have rounded up dozens in raids on the camps in recent weeks but they are struggling to deal with an underworld culture that practises extreme violence. The old Mafia-style gangs that used to rule Marseilles - including those involved in the 'French connection' drug operations of the 1970s - used to impose more discipline. "The criminal police are working flat out on this new milieu," said Bernard Squarcini, who was Marseiles police chief until President Sarkozy appointed him chief of domestic intelligence last year. "We do not get the time to infiltrate a gang when it has already been decimated," he said. "In the days of Zampa and the Belgian (two notorious gangsters), there had to be a very serious reason for a fusillade. Now they multiply whenever this or that villain comes out of prison." Jean-Claude Gaudin, the Mayor of Marseilles, insists that the overall crime rate in his city has remained relatively stable in recent years despite the rise in intra-gang violence. However, robbery jumped eight per cent there last year, in line with a surge in Paris and other big cities. Prescott Valley police arrested four members of two local street gangs Jan. 15 on charges of assault and participation in a criminal street gang, police said in a press release issued Monday.The four juveniles were fighting outside when police arrested them after dispatchers received several calls from witnesses reporting the fight, police said. Police booked the young men into Yavapai County Juvenile Detention.On Jan. 22, police executed search warrants for five residences connected with the four arrested juveniles and also found illegal weapons in addition to evidence of participating in a street gang.Police officials have been investigating numerous acts of criminal damage graffiti throughout Prescott Valley for the past five months, the release said.During that time, police with search warrants located and confiscated various examples of gang graffiti.Police declined to release the names of the gangs, saying gang members want to get their gang's name in the media. Police said they expect these types of gang crimes to happen again because gang graffiti is an ongoing problem in the area. Limerick gangs have escalated the gang war after a series of arson attacks in which four vehicles have been destroyed. Treacy was abducted with his uncle, Kieran Keane, in 2003 by the McCarthy-Dundon gang. His uncle was shot dead while Treacy was stabbed repeatedly.Treacy's sisters' car, a Peugeot 306, has also been burned out.Also at the weekend, the 2005-registered Volkswagen Passat belonging to a family member was destroyed.Arsonists also gutted the 2004-registered Toyota Avensis belonging to a female member of the family. The damage to the vehicles is in excess of €100,000, but it is the repercussions that may be inflicted upon the culprits that worry authorities most in Limerick. As far as officers are concerned, the arson attacks are a direct message to the original crime chief of Limerick gangs that his enemies are ready and waiting for his release.Christy Keane (48), who comes out of prison a grandfather, will have to return to jail if he wants to see his only son, Liam, who was yesterday jailed for the same period his father received -- 10 years. Liam Keane was arrested last May after driving a stolen car with a loaded Glock handgun which had been used to shoot McCarthy-Dundon gang member, Jimmy Collins less than a fortnight beforehand. When interviewed by gardai, Liam Keane was asked why did the gangs hate each other so much and replied: "That's life, that's the way it goes. "Liam Keane told officers he picked the gun up in a field, "out the Ballysimon way", and had it because of the way his uncle, Kieran Keane, ended up.Already some of Christy Keane's closest neighbours are fearing his release and have sold their homes. Fine Gael councillor Diarmuid Scully told a meeting of Limerick City Council's economic and planning committee that two homes in Lynwood Park, Singland, have been sold by residents ahead of Christy Keane's return. Mr Scully urged the Criminal Assets Bureau to examine whether the home was bought with the proceeds of crime.On top of this, detectives in the city this week uncovered further links between some of country's most dangerous criminals and the Keane and Collopy gangs based in St Mary's Park with the arrest of a major convicted criminal from Dublin. Rayshonne Stevens, the mother of the victim who was gunned down at Bailey and Stockbridge avenues June 7, stressed that her son was not a gang member. Ms. Stevens told Thomas "a higher power will judge you and you will pay. ""I would like to take this moment to apologize," said Thomas, who pleaded guilty Oct. 28 to a first-degree manslaughter charge and has been in custody. Thomas, who had been a friend of victim, told the judge he could not personally shoot his friend over a street fight but "in God's eyes I'm still guilty." Gerald "Nana" Gibson, 18, faces sentencing March 16 after pleading guilty in December to first-degree manslaughter plea for shooting the victim in retaliation over a street fight, according to James F. Bargnesi, chief of the Erie County District Attorney's Homicide Bureau.Gibson, of Alexander Avenue, Cheektowaga, has been in custody since his arrest in Pittsburgh as he was about to board a bus for Las Vegas two weeks after the early evening fatal shooting. Jamie Bacon, 23, was wearing body armour when gunmen in another car opened fire on his black Mercedes at the corner of South Fraser Way and Sumas Way about 3:50 p.m., hitting the leased luxury sedan several times. 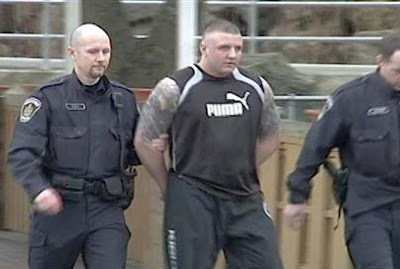 Jamie Bacon alleged member of the Red Scorpion gang appears to be the intended target of an afternoon shootout in Abbotsford. Around 4:00 pm Tuesday, police received several reports of gunfire near the intersection of South Fraser Way and Sumas Way. Witnesses reported two cars firing at each another. When officers arrived on scene they found one of the cars involved, a black Mercedes, had crashed into a concrete stairway leading to a Keg restaurant. Police say the intended target is well known to them and was wearing body armour. He was not seriously injured. Police won't confirm reports the man driving the car was known gang member Jamie Bacon. Police questioned the driver before releasing him and are still looking for the passengers of the other car. The Bacon brothers -- Jamie, Jarrod and Jonathan -- are all well known to police. In 2006, Jonathan, the oldest brother, was shot several times outside the family's Abbotsford home on Strathcona Court. No charges have been laid in connection with the shooting. In 2008, police took the unusual step of setting up a 24-hour surveillance camera to monitor the house after death threats were made against their family by rival gangs.The youngest of a trio of notorious Abbotsford brothers narrowly escaped death Tuesday after his vehicle was targeted in a wild rush-hour shooting at a busy Abbotsford intersection.One bullet hit another car that happened to be passing, though no one was injured, Abbotsford police Const. Casey Vinet confirmed.Const. Vinet said it is amazing no one was hurt in the brazen shooting. "We are concerned about the public nature of this shooting," he said. "It is intolerable...somebody could have easily been injured." "There is a public safety issue absolutely," he said. "It is one of the main thoroughfares. At 10 to four in the afternoon, there would have been a fair bit of traffic coming and going. "Abbotsford Mayor George Peary said he was in a police board meeting when he learned of the shooting, near a strip mall that houses a popular Save-On Foods. The public gunplay is extremely troubling, said Mr. Peary. "It is a matter of great concern to myself and our citizens," he said. "This family of three boys seem intent on wreaking havoc. "He pointed to the extraordinary public warning issued by the B.C. Integrated Gang Task Force last May saying the Bacons were targets of death threats and anyone near them could get caught in the crossfire. "It's frustrating because among our citizens, public safety is a very high priority," Mr. Peary said. "They want to be safe as they move about the community and of course, with bullets flying, there is trepidation." He said the police are doing everything they can to control the violence, including camera surveillance on the Bacon family home on Strathcona Crescent in Abbotsford. "They are policed as much as possible," he said, adding he will get a full briefing from police on the incident, likely today. Jamie Bacon, who is facing a series of gun and drug charges, was briefly detained after the shooting but is not cooperating with investigators. He was later released. The Mercedes, which was riddled with bullet-holes, was found a few blocks from where the shooting occurred, crashed into the concrete stairs in front of a Keg restaurant. Mr. Bacon had apparently bailed out of the car to flee his attackers.Vinet said he could not identify the intended shooting target, but The Sun has learned it was Jamie, who with middle brother Jarrod is facing 24 firearms and drug counts laid last May 31 -- the same day as the police warning was issued. "We do have a male well-known to us being questioned," Const. Vinet said before Bacon was released. As one of his bail conditions, Mr. Bacon must live at his parents' Strathcona Court home, where shootings occurred in 2002 and 2006. Eldest brother Jonathan was nearly killed in the 2006 shooting.A Surrey shooting in 2007 also targeted the brothers.Just last Friday, Jamie and his two brothers, as well as an associate, were stopped by Abbotsford Police at the busy Sevenoaks Mall after mall security thought one of them had a gun. 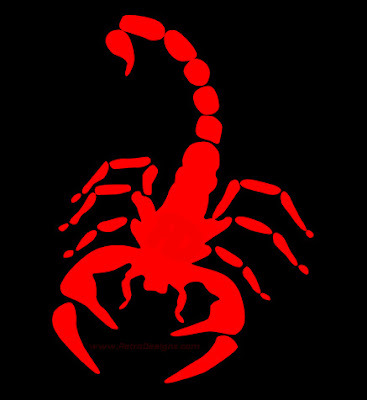 No weapon was found, but one of the brothers was wearing body armour.The brothers, who are closely aligned to the Red Scorpion gang, have been the target of death threats by rivals in the United Nations gang. Just three weeks ago, an associate named Dennis Karbovanec was wounded in a New Year's Eve shooting. Three young men have died, and police say the rivalry between Bloods and Crips is mounting. Some who lived through it recall the height of the city's gang violence in the 1980s and 1990s. "I have actual gang members saying, 'This is bad out here,' " Michael Johnson, a former Crip, told The Oregonian newspaper.In response, pastors at funerals are appealing from the pulpit to gang members to end the shooting. Police are paying overtime to put more officers on the street.Probation officers are making more contacts with gang offenders on supervision and mapping out safety plans for those who may be targets. Outreach workers are staying visible on the streets and are lobbying to keep their programs going.Dan Saltzman, Portland's new police commissioner, promised to press the City Council to maintain gang outreach programs and to try to keep local community centers open late with programs aimed at teenagers. "We don't want to wait for the shootings and just try to arrest people afterward," he told the paper. "There's just a lot of different tacks we have to take. "Although the city's homicide rate and overall crime rate are down, gang violence has increased sharply over the past year, police say.They say they identified more than 150 new gang members and seized 112 firearms from gang members in 2008, about one-eighth of all the guns they seized in the year.On Dec. 12, Darshawn Cross, 31, collapsed from multiple gunshots during a funeral in the New Hope Missionary Baptist Church.Police say near-daily shootings followed, with bullets flying in drive-by shootings, during car chases, outside busy malls and theaters and into homes.On New Year's Eve, two 18-year-olds were killed at a Gresham apartment complex. One, Willy Butler, was a half brother of the man accused of shooting Cross. "We have a crisis," said Lt. Mike Leloff of Portland's gang enforcement unit. "The 5th & Hill Gang has long been heavily involved in the sale of heroin in downtown Los Angeles, and we know they have profited from these illegal activities," said City Attorney Delgadillo, who several weeks ago filed a similar action against the 18th Street gang. "We are going to work aggressively with our Federal, State, and local partners to locate and collect their assets - and every penny we strip away from these criminals will be returned to the neighborhoods they have tormented. "$5 million civil judgment against the 5th & Hill Gang and 11 named members as part of a permanent injunction restricting the criminal activity of the gang and its narcotics associates in the historic core of the City´s downtown area. This civil judgment is the first ever obtained against a criminal street gang.Approved by L.A. Superior Court, the permanent gang injunction severely restricts the ability of the gang to commit criminal and nuisance activity, including the sale of heroin and other narcotics within the established downtown Safety Zone as defined within the boundaries of 2nd Street to the north, San Pedro Street to the east, 9th Street to the south and Olive Street to the west. At the core of the Safety Zone is the northeast corner of Pershing Square, at which 5th and Hill Streets converge. Terms of the permanent injunction include many of the standard gang injunction provisions, including limiting the gang´s ability to associate in public with other members, intimidate witnesses, to sell or possess drugs, or to possess weapons or graffiti tools. A unique provision of the injunction makes the gang injunction effective, not only against gang members, but also against the gang´s "Heroin Sales Associates" - defined as anyone arrested twice for possession for sale, or sales where the alleged controlled substance was heroin, and the arrest occurred within the established Safety Zone. This new provision was sought by city prosecutors because 5th & Hill Gang members attempt to insulate themselves from criminal liability by using non-gang members to move their product on the street. "The Fifth and Hill Gang injunction and now the first ever civil judgment of its type, are evidence of a healthy prevention-focused partnership between the community and different components of the criminal justice system," said LAPD Chief William Bratton. "We will use these tools judiciously to improve safety and to help dismantle violent gangs." In addition to granting a permanent gang injunction, the Court also awarded $4,200,000 in civil damages against the 5th and Hill gang as well as gang members Jesus Barcenas, Everado Bautista, Adolfo Catala, Alejandro Delatorre, Jesus Gonzalez, Carlos Hernandez, Juan Bautista Osorio, Carlos Quiroz, Marco Rivera, Gustavo Roman, Jr., and Cesar Tovar. The Court also awarded an additional $857,500 in civil penalties against the gang and the named members for their violations of the State´s Business and Professions Code Section 17200. "Because of our innovative and creative solutions to the gang problem.like the City Attorney´s new civil damages actions - we´re making Los Angeles one of the safest big cities in America," said L.A. City Council President Eric Garcetti. "I look forward to working with City Attorney Delgadillo to ensure that any money he recovers is distributed to the communities damaged by these gangs, as quickly as possible." "I want to congratulate the City Attorney for thinking outside of the box to bring down this opportunistic street gang," said Councilmember José Huizar. "And I´m happy to hear that the gang´s drug profits made off of the misery of others is going to be returned to the communities they originated in to do some real good." The injunction - prosecuted by Gang Division Deputy Jim McDougal - includes more than 400 pages of declarations from law enforcement officials regarding the long-standing criminal activity of the 5th & Hill Gang located within the historic core of downtown Los Angeles, as well as declarations submitted on behalf of the local Business Improvement Districts regarding the economic harm caused by the 5th & Hill Gang. The 5th & Hill Gang is known to have a monopoly on heroin sales in downtown Los Angeles. A vast majority of crimes committed within the Safety Zone, including graffiti and assaults, are related to heroin sales business conducted by the gang. The City Attorney sought a preliminary gang injunction against the 5th & Hill Gang in November 2007, and the preliminary injunction was granted in February 2008. As part of the original filing, City Attorney Delgadillo´s prosecutors included an additional Cause of Action pursuant to penal code Section 186.22 a(c) seeking damages using the 2007 Amendments to the STEP Act signed into law by the Governor. That amendment expanded existing law to provide prosecuting City Attorneys and District Attorneys with the authority to seek damages against gang members under injunction, and to collect from them assets acquired from their criminal activity. "This is exactly the kind of anti-gang impact that we hoped to see with the passage of SB 271 and SB 1126," Governor Arnold Schwarzenegger said. "By giving prosecutors more tools to fight gang activity at the local level, we are protecting our communities at the same time we're able to strengthen our statewide anti-gang efforts. "The December 2008 filing against members of the 18th Street gang was a stand-alone damages action filed pursuant to the 2008 Amendments to penal code Section 186.22 a(c), and was the first to make use of the passage of SB1126 which authorized prosecutors to collect damages from any assets the named gang members have to satisfy the judgment, whether or not a direct link is established between the criminal conduct and the asset. Since taking office in July 2001, City Attorney Delgadillo has increased the number of gang injunctions from eight to 40, covering more than 65 gangs and more than 61 square miles of claimed gang territory in Los Angeles. In addition, LAPD reports cite a 33 percent decline in gang membership since 2001, and a 25 percent reduction in gang crime since 2002. Outbreak of gangland violence after two murders and at least three attempted murders in the opening week of the New Year. Outbreak of gangland violence after two murders and at least three attempted murders in the opening week of the New Year.The long-running feud between two gangs in the south inner city is fully expected to flare up after members of the two gangs bumped into each other in a city-centre take-away in the early hours of January 3. One man was struck on the head with a hammer and then repeatedly kicked in the head as he lay senseless on the floor. The victim is still in hospital and it is not yet known if his injuries will cause permanent brain damage.Shortly before that attack, a gunman called at a flat in Pearse Street, pointed a gun at a man who answered the door and pulled the trigger. The gun failed to fire. Gardai said the victim was an entirely innocent person and they believe it was a case of mistaken identity. They have yet to find the intended victim.Then, within the space of two hours on Wednesday evening last, two men were murdered in central Dublin and another shot and severely wounded at a house in Kinsealy in north Dublin. The Kinsealy victim is expected to recover, despite being shot in the chest and neck.Gardai admitted last week that they are uncertain as to why gangland violence has flared again in the city. Despite an amount of conjecture, gardai do not know the reasons for the murders of Michael 'Roly' Cronin, 35, and his associate James Moloney, 26, a man with no known serious criminal involvement, in Summerhill in the south inner city at 8.40pm last Wednesday. While it was known that Cronin was at odds with other drug dealers in the Finglas, Coolock and Blanchardstown areas, it was not clear why he was back in his old neighbourhood in Summerhill in the north inner city where other gangs control the drugs -- particularly heroin -- supply in the city centre. Gardai have a firm suspect for the double murder, a man in his early 20s from the north inner city area, described as a relatively minor gangland figure. The gunman was in the back seat of Cronin's car as it pulled into Langrishe Place off Summerhill. He apparently shot Cronin, who was driving, in the head, and the car crashed into a barrier. He then turned the gun on Moloney, shooting him twice in the head. Two hours after the double killing, a gunman forced his way into a house in Drynam Drive about six miles away in Kinsealy, then rampaged through the house looking for his 29-year-old victim. A young woman visiting the house with her baby was cornered in a bathroom where the gunman pointed his gun at her. His victim was hiding in a bedroom barring the door and the gunman fired through it, hitting him twice. It is believed that a drug gang from the Coolock and Darndale area was behind the attack, which is not thought to be linked with the shooting in the north inner city.Senior garda sources said last week that while they were anticipating violence in the Finglas and other north-western areas of the city, the double killing in the north inner city and the rekindling of the south-city feud are worrying developments. As it does every few years, the character of the gangland scene in Dublin is changing, and younger, and, according to gardai, more ruthless gangs are yet again emerging. Three men were shot near Pioneer Square early Friday, one of two shootings investigate by Seattle police in the span of 30 minutes.The victims, 34, 28, and 23, were walking or standing in the 100 block of James Street when the shooter emerged from an alley about 2:35 a.m. and fired multiple blasts, police spokesman Mark Jamieson said.One of the victims' friends pulled him into the trunk of a car and drove him to Harborview Medical Center. The other two victims were treated by medics and taken by ambulance to the hospital, Jamieson said. "We're still trying to sort it out. But it doesn't appear that this is a random thing," he said.Homicide and gang detectives were investigating and trying to identify suspects. No one has been arrested, Jamieson said.Police detained the driver who took the victim to the hospital, but it appears that person was a witness and not involved in the shooting, Jamieson said.About 30 minutes earlier, police were called to a University District bar, where patrons traded gunfire outside.No one has been arrested, but police found a handgun stashed in the wheel well of a vehicle parked outside the bar in the 5500 block of University Way Northeast. Officers also recovered four .40-caliber casings and one spent bullet, Seattle police reported. The gunmen exchanged gunfire in front of the bar and in an alley behind it. Police were unable to find suspects or any victims. 19-year-old Juan Vasquez was arrested early Friday on suspicion of killing two teenage boys. El Paso County sheriff's Lt. Lari Sevene says 19-year-old Juan Vasquez was arrested early Friday on suspicion of killing two teenage boys. It wasn't immediately clear if Vasquez had an attorney. Investigators say a shooting east of Colorado Springs that left two people dead stemmed from a gang-related clash over a stolen iPod.Deputies responded to a report of a fight involving nearly two dozen people at about 4 p.m. Thursday near Cimarron Eastridge Park, and found at least one person performing CPR on a shooting victim.One person died at the scene. The second died at a hospital less than an hour later.The names of the victims have not been released, but Sevene says they attended Sierra High School and New Horizon School. Chilling execution of Su'a, a former missionary and self-made contractor, at the hands of city gangsters embroiled in an ongoing rivalry took only seconds to unfold on New Year's Day.Su'a was drinking tea when gun-men burst inside the cafe. Shots were fired, hitting and killing two young men seated at the table next to Su'a. He scrambled to escape the restaurant unharmed, but came face to face with another gangster waiting outside. A few words were exchanged, shots rang out, and Su'a's body hit the pavement. He was killed instantly.Friends and loved ones say they are struggling with their anger at the gang-fuelled violence that claimed an innocent man. "It's important that people know what Keni stood for. What happened affects everyone in Calgary," close friend Tannis Keteca said. Senior Cpl. Norman Smith,was shot in the head and taken to Baylor University Medical Center at Dallas, where he was declared dead about an hour later. Senior Cpl. Norman Smith, 43, was with about six other officers serving a felony warrant in the 4900 block of Wadsworth Drive. Smith knocked on the door of an apartment about 6:15 p.m. and came under fire almost immediately, police said.He was shot in the head and taken to Baylor University Medical Center at Dallas, where he was declared dead about an hour later.Three suspects were taken into custody, police said. The men were being questioned and had not been identified. Police Chief David Kunkle said the officers serving the warrant were attempting a "ruse to try to get the suspects to the door without announcing that they were police officers." "This was a high-risk situation," Kunkle said. "The officers were tactically well-positioned, but they were immediately met with gunfire." Smith joined the department in 1991 and would have marked his 18th year on the force today. Smith had an extensive knowledge of Dallas' gangs and was described by Kunkle as one of the department's finest police officers. "I would have thought he was invincible," Kunkle said Tuesday night, choking back emotion. "He was a great, great street officer. He had the heart of a warrior. "Smith's death was believed to be the nation's first fatal shooting of an officer in the line of duty this year. He is the first Dallas officer shot to death in the line of duty since Mark Nix in 2007. Lt. Sally Lannom, a former member of the gang unit, described Smith as a hard worker who knew his job well and would be sorely missed. "It's a huge loss for the department and a huge loss for those of us who knew and loved Norm," Lannom said. Smith was married to Dallas police Lt. Regina Smith. They met when Norman Smith was working at the Dallas County Jail. "Norm was working there, and he came up to her and said, 'You're the most beautiful woman I've ever seen,' " Kunkle said.Lannom said Smith was an expert on the gangs in the southern sector, where Tuesday's shooting occurred. "He worked that area in patrol," she said. "He knew that area. It made sense when he came to the unit to become the expert on the gangs in that part of town. "Kunkle said Smith "could go into the toughest neighborhoods and be respected." On Tuesday, Smith and about six other gang-unit officers were in search of a violent felon at the Oak Wood Place Apartments, police said.Smith, flanked by two other officers, approached the door and knocked. Someone inside asked who was there, and Smith responded with a fake name, police officials said.When the suspected gunman opened the door, Smith yelled that they were the police, according to the preliminary investigation. The suspect then tried to close the door, and Smith pushed back. That's when he was shot.Officers returned fire, frantically trying to pull their fallen comrade out of the line of fire as the gunman opened the door and continued shooting. No one else was injured in the gunbattle.The three men inside the apartment then surrendered, one at a time, within minutes of the shooting. Hours afterward, a SWAT unit remained at the scene, and police officers roamed the complex on the northeast corner of Wadsworth and Loop 12.Surrounded by a black wrought-iron gate, the apartment complex has long been known as a haven for drug and gang activity.In 1998, it was the scene of a gunbattle between police and drug suspects. Someone fired through an apartment wall, hitting Dallas police officer Edward Menchaca in the hip. A second police officer was grazed by a bullet. The officers were investigating a tip that a drug deal was going on inside the apartment.Kunkle said Regina Smith, who works in his office, was devastated by the news, just as he was. "These are just people that I have tremendous love and affection for," he said. "They're all tough, but for me this is a really difficult situation. "Built like a middle linebacker, Smith stood well over 6 feet tall and was known to be even-tempered, opinionated and even sentimental. Lannom said she was introduced to her husband by Smith. "I still remember Norm standing there all embarrassed, asking me if I wanted to go out with Jon," Lannom recalled. "I owe my husband to Norm. "Lannom said Smith's mother is from Europe, and he spent a portion of his youth there. Before joining the Dallas police, Smith worked as a Kaufman County sheriff's deputy.The Smiths have two teenage children, a boy and a girl. Those who knew the couple well said they enjoyed antiquing, collecting fine china and traveling in their off-hours. "They were just magical together," Kunkle said. Smashed a dissident Republican cell which was selling weapons to Dublin crime gangs. Five suspected members of the Continuity IRA remained in custody today after officers from the Special Detective Unit raided a number of properties in south County Dublin.Six replica handguns were seized in the operation, which was launched on Sunday night after SDU officers stopped and searched a car travelling through Tallaght.This was followed by a raid on an apartment in Loughlinstown, where the imitation firearms were recovered, along with more than 60 rounds of ammunition. The guns can be converted to fire live rounds, and officers believe that the CIRA cell was planning to make the conversion and sell the weapons on to figures in Dublin's underworld.A leading member of the Dublin unit of the CIRA, in his 60s, was arrested after the guns were uncovered.Three younger men, all in their 20s, were also arrested. Detectives believe that these men were involved in moving the weapons. A woman in her 20s, known to the men, has also been detained. All five are from the Ballybrack and Loughlinstown areas of south Dublin.All five people are being held at garda stations in Terenure, Blackrock and Shankill, and can be held for questioning until Thursday under section 30 of the Offences Against the State Act -- anti-terrorism legislation.A source said: "The older prisoner is well known to the Special Branch and has a lengthy involvement in subversive activities. "We believe that he was running a guns-for-sale scam, where replica and altered weapons were being sold to crime gangs in south and west Dublin. "Most of the replicas are sourced from the North and transported by train to the capital, where they are then modified and sold on. "The guns and ammunition were brought to the Garda Technical Bureau at the Phoenix Park yesterday, where they are undergoing forensic examination.Ballistic tests on the seven weapons will also be carried out, to establish if any of them was capable of firing. Fresh Off the Boat gang and the FOB Killers gang has claimed over two dozen lives since 2002 in Calgary.One of the three victims was identified as 22-year-old Sanjeev Mann of the FOB Killers gang. Police said Mann had been involved with the gang since his school days when students formed the FOB gang to run a 'dial-a-dope' operation to deliver cocaine, marijuana and other drugs at people's doorstep after taking orders on cell phones. Later, some students broke away from the FOB gang to form the FOB Killers gang, leading to open warfare between the two groups. Mann has been a victim of the gang violence in the past. In 2007, he was shot and seriously wounded in front of his southeast Calgary home, a local newspaper reported. He was arrested last year by police under an operation to crack a cocaine trafficking ring and charged with possession of cocaine for the purpose of trafficking, manufacturing a controlled substance and possession of proceeds of crime, Calgary Herald reported.Though more than 100 Indian-origin youths have been killed in drug-related gang warfare in the Vancouver area since the mid-1990s, Calgary has not seen any Indian-origin person killed in drug-related violence till now. 'We are still a close-knit community and we don't have the kind of problems that Indian immigrants face in the Vancouver area. Our young men are not into this kind of thing. This is an odd case,' 27-year-old Manmeet Bhullar, who was elected to the Alberta assembly last year, told IANS. 'But we are definitely seeing some negative influences, and Mann is the first such victim,' he said.